Join Norman Marks and Paul Sobel for a conversation about what it takes to have a world-class internal audit function. Norman Marks, who is not only an OCEG Fellow but an Honorary Fellow of the Institute of Risk Management, led the internal audit activity at global corporations for about 20 years; he is the author of World-Class Internal Audit: Tales from my Journey and a new book, World Class Risk Management. Paul is the Vice President/Chief Audit Executive of Georgia-Pacific LLC and a former Chairman of The Institute of Internal Auditors. Our world is constantly changing and change is the order of the day. Has a gap been created between the value executives and boards need and what IA has traditionally delivered? Is it time for transformation? In today’s world of rapidly changing risk profiles, how has risk-based internal auditing changed? Should we now call it enterprise risk-based auditing? Is our primary mission assurance or consulting/advisory? How often should the audit plan be updated? Are audit reports the best way to communicate results? Should the CAE issue a formal report on the adequacy of internal control? What about an opinion on the management of risk? IT-related risks continue to grow; how should a CAE determine how many of his scarce resources should be devoted to technology? Of the new Principles for Effective Internal Auditing, which is your favorite and why? How do you build relationships with executive and operating management? How do you get the best out of an internal audit team? What does a savvy CAE do to win the war for talent? Does IA need to educate the audit committee of IA’s potential so that it demands more? 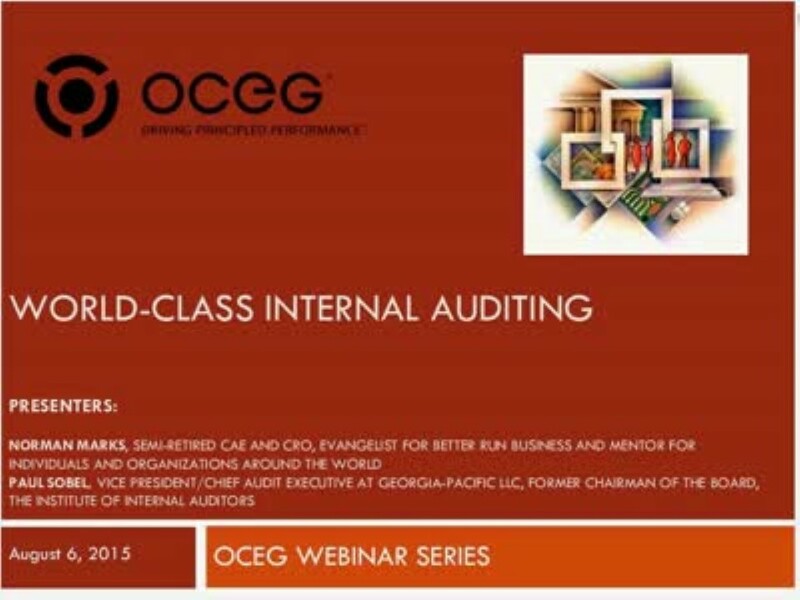 What is world-class internal auditing? We have emailed instructions to access World Class Internal Auditing to . Make sure the email arrives in your inbox: either add "support@oceg.org" as a safe sender to your email platform, or if you use Gmail, drag our email into your Primary tab.